Is Jo Becker Appearing At HRC Headquaters On 4/26? Only HRC Knows And They Ain't Telling. Home/Featured/Is Jo Becker Appearing At HRC Headquaters On 4/26? Only HRC Knows And They Ain’t Telling. Is Jo Becker Appearing At HRC Headquaters On 4/26? Only HRC Knows And They Ain’t Telling. Surprisingly considering the major controversy that her “so-called” history of the LGBT marriage movement and her over adoration of the “handsome and bespectacled” Chad Griffin that on Saturday April 26th Becker was scheduled for a book signing and talk at HRC Headquarters in Washington, D.C.. 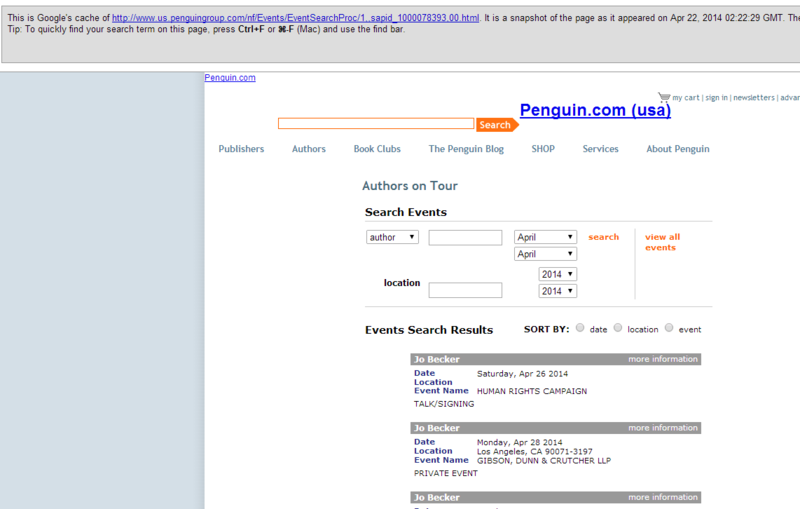 I have the cached screenshot of the now deleted event – calendar from Penguin, Becker’s publisher from 4/22 which before it was mysteriously removed. So I called HRC headquarters and tried to get an answer the HRC spokesman Carl Garcia who wouldn’t deny or confirm that an event featuring Becker was happening. Garcia kept saying that there is one event being held on Saturday and that it was a “private event” But would not elaborate. Carl though was very interested where I got my information. And we weren’t the only ones getting the runaround. Andrew Sullivan tried to get information and ran into the same stumbling block. And today HRC asked Justin Snow from MetroWeekly to correct a story about the Jo Becker event but again wouldn’t say if they canceled it or not. Just another in a long line of transparency and integrity FAILS by the Human Rights Campaign.